I-joists are engineered wood members normally used in residential and commercial construction in substitution of dimensional lumber joists, such as 2 x10 and 2 x 12. I-joists offer advantages over conventional lumber products providing savings for the builder and better performance and longer lasting endurance than regular lumber. In order to get these savings, you will need to be very careful when managing I-Joists, so that's why we have the following tips for you. I-Joists should be stored and stacked vertically and leveled when they will not be in use. Do no store I-Joists in places where they could enter into direct contact with the ground. 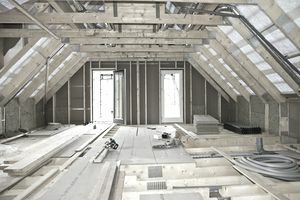 I-joists bundles should be opened when they are ready to be installed. I-Joists are not stable or capable of withstanding loading until they have been properly installed and fully braced. I-joists should be braced and nailed as they are being installed. Use correct joist hangers, blocking panels, rim boards and cross-bridging at joist ends. I-joist temporary bracing must be 1 x 4-inch minimum, at least 8 feet long and spaced no more than 8 feet on center. I-joist temporary bracing must be secured with a minimum of two 8 d nails fastened to the top of each I-Joist. When using cantilevered I-Joists, brace top and bottom flanges, and remember to brace ends with panels, rim board or cross-bridging. Install temporary bracing or temporary sheathing to prevent I-Joist from rolling over or buckling. Once the structure is completed, the floor sheathing provides lateral support for the top flanges of the I-Joist. Blocking is required at interior support when I-Joists are applied continuously over interior supports. These blocks must be larger than the I-Joist depth in order to carry the full load. Remember to fasten these blocks to the I-joists top and bottom flanges. Reinforce the center web of the I-Joist with wood blocks on both sides of the I-joist and at the bearing points. The wood blocks will prevent the joist from buckling. Never cut, drill or notch I-Joists flanges. These extra cuts will reduce I-Joist load capabilities by creating additional stress and the I-Joist could fail later. The center web of the I-Joist should be drilled. Drilling should only be made following certain procedures as instructed by the I-Joist manufacturer. Some holes as large as 1 ½” in diameter can be cut in the I-joist web without consulting. However, I-Joist manufacturers should provide distances required between holes, between flanges, between final hole and bearing point, and between any other significant portions of the joist. Never attempt to repair or install a damaged I-joist. The APA standard makes engineered I-Joists wood easy to order. I-Joists are available in deeper depths than standard floor joists. I-Joists can be ordered with depth up to 16 inches, allowing their usage on greater spans. I-joist is more consistent in size and shape than traditional floor joists. I-joist span standards make them a stiffer floor. Wide flanges provide a larger gluing and nailing surface for floor and roof sheathing. Openings can be strategically cut in the I-Joist web to allow for wiring, ductwork, and plumbing. One I-joist can do the work of two or more solid joists. Between 15% and 20% of I-joists are now being built with solid-lumber flanges. Slightly reduce the space between joists, making the subfloor a bit stiffer.